So it looks like this whole series of Doctor Who is made up of two-parters with matching titles? I approve - a nice throwback to the original series without actually going back to four- and six-part stories that spent the middle bit running around corridors because they ran out of story. And the tenth anniversary of the new series is a good time to go for it. But I can't have read the series preview in the Radio Times that carefully because I totally missed that this was what they were doing. "Under the Lake" / "Before the Flood" by Toby Whithouse, directed by Daniel O'Hara. Spoilers after the cut. 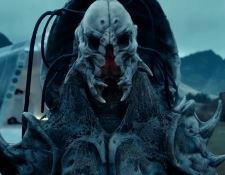 Have the Paul Kaye species of alien who keep getting invaded because they're so annoying appeared before? Maybe not on the TV show but in one of the spin-off novels? Or they could even be a Douglas Adams creation, in any case I feel like I've read about this species before, if not necessarily seen them on the show*. The Fisher King meanwhile - I know not everyone was impressed but I thought it was a great design, that even held up when it came into the light. And is this really the first time Peter Serafinowicz has voiced a Doctor Who creature? He seems like such an obvious choice you'd think he would have done it years ago. Good pair of episodes, Capaldi again a much more likeable Doctor, the flashcards in how to behave like he cares about people a nice way to balance the oddness with a bit more of a natural performance. The sonic sunglasses sticking around though? No thanks. *It's been pointed out to me that one has appeared in a previous Toby Whithouse episode, played by David Walliams. Which may explain why I remembered the concept, but had blocked the actual performance from my memory. The aliens are the same species as David Walliams in Whithouse's The God Complex.